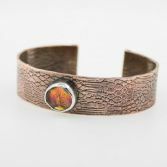 Handcrafted textured Copper Cuff with handmade glass cabochon set into fine silver. The copper Cuff is 15mm wide and has a pretty pattern stamped into the surface which catches the light giving it a nice tone. 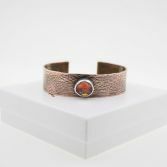 On the top of the cuff theres a beautiful glass cabochon with refective dircohic glass with shimmering oranges reds gold and green which is set into a sterling silver setting. 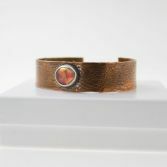 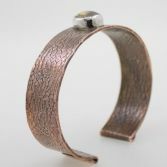 The Copper Cuff has a little flex in it so it is suitable for a small or medium wrist. 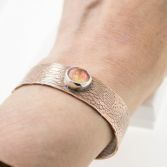 Your Copper Cuff with Glass Cabochon will be presented in one of my signature gift boxes and posted via Royal Mail 1st class post free of charge to any UK address.